On Sunday I finished packing my car, stuffed any remaining crevices with raw milk from Freedom Hill Dairy for the last time and garlic cloves from Keith (yep, I even filled my boots with them), had a brief cry with Flavia, hugged Keith, Matt and Kobe goodbye, and moved home. I realized on Christmas Eve, one day later, that I would not be able to settle down. Also I needed a repair foundation service because the foundation was in a really bad shape. On Christmas day, I coerced Glenn into helping me oil his rototiller, and with the help of my cousins Greg and Allen, we tilled two 40-foot beds in the lot next to my house. 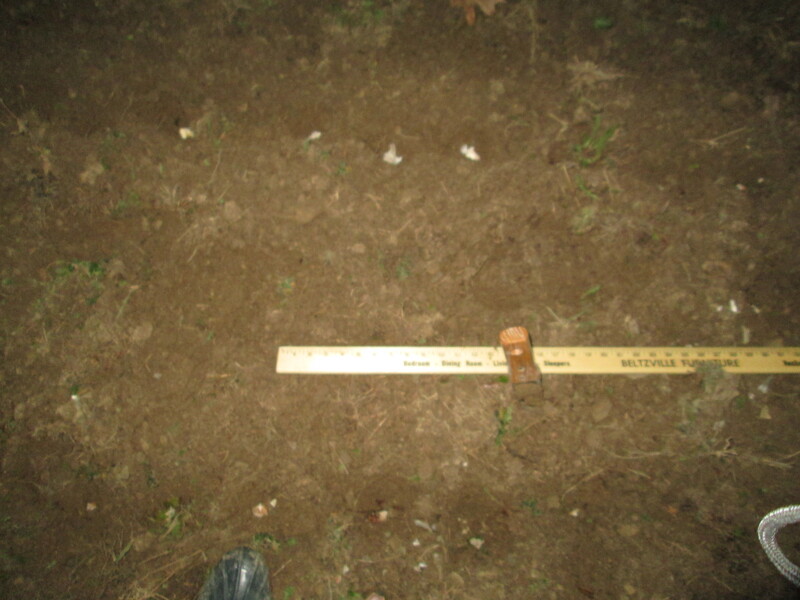 That night after the rest of my family left, I went out with my headlamp, my mom’s soil knife, a yardstick and a boot full of garlic, and planted 200 cloves in the first bed. Yeah, it’s dark. That doesn’t stop us! It is apparent that Mom Wagner is already concerned about my mental stability. But with all this garlic sitting around, knowing some if it is in the ground was a huge relief. And the next morning, when everyone in the Wagner house woke up before 5am like a pack of freaks, Jess and Mom decided to join team Farmstead. We suited up, Jess in her second rate running gear and mom in her new muck boots, and went out to the farm where my uncle Butch has been piling pheasant manure for the field. We loaded up buckets and tubs in the back of Glenn’s truck, hauled them back and mom and I worked through the then frozen second bed to plant another 200 cloves and spread manure over both beds. So, 404 cloves in two days. A pretty nice haul for the Wagner women in the midst of the holidays. The Wagner women working hard. Mom Wags and our trusty sidekick getting our garlic maintenance on. Christmas itself was a blast. All my aunts and uncles and cousins come to our house for a day of awesome, and everyone was excited that both Wagner daughters were home and in fighting fit. All of them offered me a couch or a room when I need a break from living at home, to which I am very, very grateful. The family got garlic and veggies and dried herbs, Mom Wagner got Carhartt hats and a Leatherman work knife, and Glenn literally got a mountain of meat from some of my favorite vendor neighbors, like a duck from Ben at Garden of Spices Poultry Farm, skate and tuna steaks from Blue Moon and Amanda and Mike’s incredible meat from Tamarack Hollow in Burlington, Vermont. Farmer Christmas was a huge success. Christmas braising mix – it warms my heart to hear my family say they like kale. Meat mountain! And yes, Glenn cut a Keith’s Farm-style Christmas tree, so I cleaned it up and gave it a home. But now there are inches of snow between me and any more progress, and some of my friends are already concerned that I will snap without a task to do. But little do they know, there is always something to be done. Now that I am confined to a house, I have been 1) forced to unpack (much to my mom’s enjoyment), 2) obligated to set up a bedroom workspace (which used to be reserved for bad fiction writing of the young adult fantasy persuasion, and then just fiction for pseudo-adults, and now farm plans and field maps), 3) coerced into blogging and listening to the last Pandora quickmix that Matthew left up on my computer before he left (not that I don’t want to blog, just that sleeping forever is so much more appealing in this icy wasteland of Pennsylvania – and the Mountain Goats just came up on this playlist, Matthew so good job), 5) moseying down to the Health Habits, the health food and supplement store where I’ll be putting in some hours to stay busy, and 6) perusing seed catalogs and using some of my sweet, sweet Christmas money to buy seeds. So, as you can see, there is plenty to do. I just have to get it together and do it. Which can be easier said than done when you are a person who hibernates through the winter months. But my family is excited, and it’s contagious. Everyone has some anxiety about Glenn and I functioning under the same roof, but on Christmas morning we showed each other that we might survive this. I was out running on the treadmill, he came in and got on his elliptical machine, and we ran side by side for half an hour watching Fiddler on the Roof (which, if you know anything about the musical, is one that Nate Adams refers to as “Daughters Will Kill You: The Movie”). So, you know, that’s something. It is weird to wake up in my kid bedroom now. I’m having trouble adjusting to being around clean, non-farmer people who believe in taking showers daily and washing their dishes thoroughly. And though I had no idea this would happen so soon, I miss my Tomato Boys. I miss Keith and Flavia. And I’ll never be able to thank them for all they’ve showed me and done for me in the past eight months. But I have a lot of catching up to do in my home state, and a lot of new adventures to begin. I can’t wait. Christmas Farmer Liz – Yeah, maybe I wore this for the last week and a half on the farm. But with a Santa sweater like that, wouldn’t you? And sure, I look like a hot mess. But so would you if you worked three markets and were an emotional wreck right before the holidays. Womp womp womp. This entry was posted in Uncategorized and tagged Braising Mix, Christmas, farm intern, Fiddler on the Roof, Garlic, Garlic Planting, Keith's Farm, Organic Farming, Real People, Tomato Boys, Wagner Farmstead by wagnere1. Bookmark the permalink. Don’t worry about mom Wagner, she knows you’re crazy. As far as after Christmas, she likes playing in manure. Liz! . . Found you . . . .
By the way, did I tell you you are loved? It used to brighten and enliven my all whenever I saw you at the farmers’ market. Liz! Found you . . . I miss you lovely face and radiating smile that I learned to love now that the farmers market is gone. Stay in touch you are loved.